Strobe Security Solutions is a North Wales leading installer and maintainer of up and over garage doors. Our Steel Up & Over Garage Doors are the classic choice for your home. Corrosion resistant garage doors, manufactured from premium grade galvanised steel are available in a huge range of available colours in both RAL and BS. These garage doors are supplied with a strong steel ‘goalpost’ frame, so you can wave goodbye to your old wooden garage door frame. All doors are available with either Canopy or Retractable spring assisted gear systems for smooth, safe and reliable operation. Doors are available for manual operation or, for a touch of luxury, retractable doors can be fully automated with a remote controlled electric operator. There are mainly two types of up and over garage doors, they are canopy doors and retractable doors. Canopy doors are the traditional garage doors that allow extra drive-through width, not achieved with the retractable door. This is because the lifting mechanism is contained above the door. Retractable doors are similar to canopy doors in style and finish but have a different lifting mechanism contained at both sides of the door. Ideally suited for electric operators, which can also be fitted retrospectively to suitable doors. Available in a selection of Standard colours and 100’s of RAL and BS colours. Minimalist and Traditional designs to suit all types of homes. Smooth and woodgrain finishes to match perfectly with your uPVC windows. Unique deep pressed panels giving a high level of panel detail. Steel chassis with steel bracing to reinforce the door without adding excessive weight. Made with premium corrosion resistant steel, manufacturer in Britain. Over 15 timeless designs to suit every home. 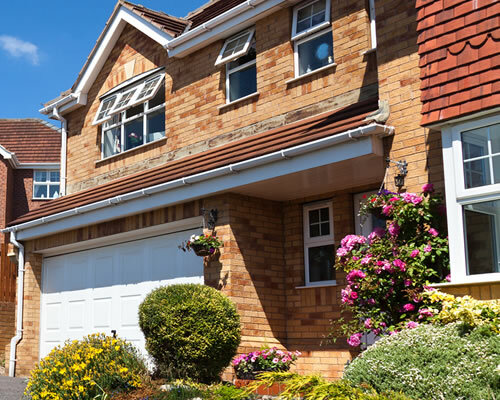 Strobe carries out repairs to a wide range of garage doors including, but not limited to, brands such as: Henderson, Garador, Cardale, Hormann and Novoferm. Covering Conwy County and parts of Denbighshire and Gwynedd in North Wales, we have a lot of experience in repair work so you can trust that your door will be in safe hands.